Winter wheat variety trials are conducted across the state to evaluate yield, protein, and weight of different varieties under different conditions. This summary looks at lessons learned from the 2018 wheat variety trials (some sites garnered excellent yields) and how to use data from multiple trials to aid seed selection for the 2019 crop. Dr. P. Stephen Baenziger speaking at a wheat variety trial field day at the High Plains Ag Lab near Sidney in 2018. Results from the 2018 wheat variety trials show performance leaders in each of four districts across the state. Figure 1. The first year of a winter wheat seeding date study was conducted in this Panhandle field in 2018. Wheat seeding date affects multiple factors contributing to wheat yield. While there's no perfect date for all conditions, these recommended dates have been proven and verified. Uncontrolled Russian thistle in seeded winter wheat field. Managing weeds at least two weeks prior to planting winter wheat and then controlling winter annuals this fall are important to reducing disease, saving soil moisture, and achieving top yields next summer. Figure 1. Comparison of two wheat research plots near Scottsbluff. On the left is an untreated control plot with a heavy infestation of downy brome and feral rye. On the right the same population of grassy weeds was treated with Aggressor herbicide, part of the CoAXium Wheat Production System. A new herbicide-tolerant wheat production system was officially unveiled in 2018 and offers growers a new means to control grassy annual weeds in wheat. Should I Plant Treated Wheat Seed? Using clean, certified, treated winter wheat seed optimizes the chances of obtaining high yields. Seed-transmitted diseases and fall insects can reduce grain yield as well as quality next summer. Figure 1. Wheat lodging due to wheat stem sawfly. Figure 2 (inset). Wheat stubs remaining in field after sawfly feeding. The sawfly will overwinter in the stub and leave the plant in the spring. One of the newest challenges to wheat growers is the wheat stem sawfly, which can girdle stems, causing lodging and yield losses. University research may offer a clue to new control practices. 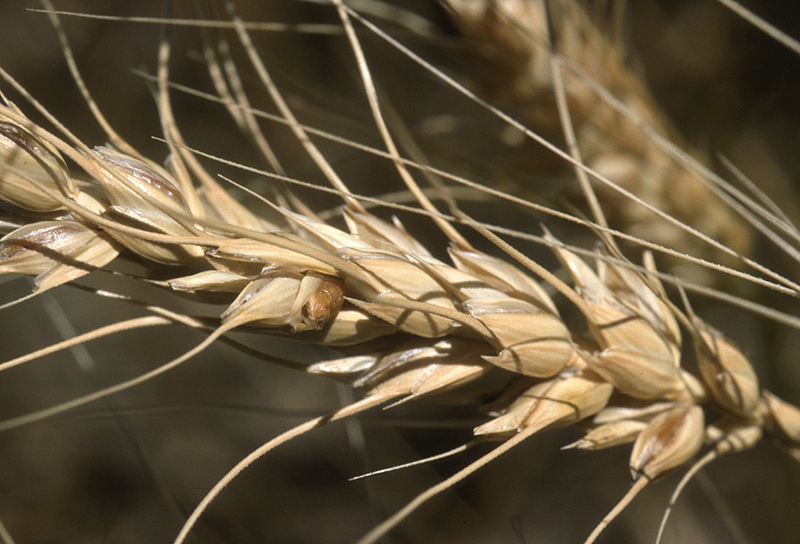 Managing the wheat curl mite is critical in managing the disease risk to winter wheat, particularly in central and western Nebraska. This article outlines key risk factors to manage. Four videos illustrate the spread of wheat curl mites among neighboring wheat fields and the importance of controlling these mites to curtail the development of three key viruses of winter wheat in Nebraska. For corn growers with cattle or whose neighbors have cattle, making silage from late-season hail-damaged corn can be a good option. Here's what to consider. View daily demonstrations of corn residue baling equipment and get answers to your questions about its use at this year's Husker Harvest Days. Eligible producers and landlords must file Syngenta GMO litigation settlement claim forms no later than October 12, 2018. Will a Date-Driven Winter Wheat Marketing Plan Improve Your Revenue? This article evaluates various date-driven winter wheat marketing strategies, using 20 years of prices for Kimball, Nebraska. It compares each year’s average harvest price and the probability of the average price of a strategy being higher than the cash price at harvest. Nebraska Extension has published seven wheat production budgets to help growers identify total costs under different scenarios as well as potential opportunities for trimming costs. When and how should you use cost depreciation and when is better to use match depreciation? Each method offers benefits and can help guide decision-making. Attendees at Husker Harvest Days, Sept. 11-13 near Grand Island, can find the University of Nebraska-Lincoln's Husker Red steel building at Lot 827 on the southeast side of the exhibit grounds. “Managing Change and Challenge: Strengthening Nebraska’s Agricultural Economy” is the theme for university exhibits at this year's Husker Harvest Days. Exhibits will outline strategies and tools that can directly impact the economic well-being of farm and ranch families. Soil Health Workshops and hands-on field labs Sept. 12-14 invite growers to learn how to examine soil biota and gauge economic returns from changing their practices. Speaking at all three is Jimmy Emmons, a no-till farmer and rancher from Oklahoma. LEAD welcomes 29 fellows for the two-year agricultural leadership development program. Can You Help Weed Scientists Assess IWM Knowledge and Use? How much do you know about Integrated Weed Management (IWM) strategies and their application to your operation? What information do you need?